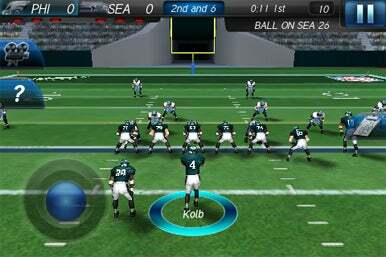 Gameloft's NFL 2011 for iPhone keeps everything that made NFL 2010 successful, and adds on a small handful of gameplay and visual improvements. The result is a fun football simulator, with a few new minor annoyances, but a very solid enjoyment factor. While the background visuals may not be as impressive as Madden's, NFL 2011 is still a solid football sim. Last football season, I reviewed NFL 2010 for iPad and complained about the 30-second video that you had to skip every time you launched the app. The good news is that the 30-second clip is gone; the bad news is that it’s been replaced with a 37-second video instead. I long for the day that game developers realize that they’ve already sold the game, and needn’t force their customers to dismiss promotional videos whenever they want to play. Outside of that video, though, NFL 2011 does plenty right. The game offers full rosters for every NFL team, realistic (and not overly repetitive) commentary, and a massive playbook. The graphics are notably improved over last year’s version, looking crisp and smoothly animated on my iPhone 3GS. NFL 2011’s control scheme works fine. You use a virtual joystick to move your player, and the game employs the now-familiar “action buttons” interface that characterizes sports simulators on iOS. These buttons can be used for actions like sprinting or breaking tackles. New this year is a "truck" button, which is far and away the most satisfying control; a well-timed tap can bowl over your opponents with a delightful crunch. Other new control mechanisms this year are on the whole welcomed improvements. I’m not a fan of tilting the iPhone to juke, for example, but the new kicking interface—a sliding control reminiscent of swinging in iOS golf games—is a decided improvement over last year. I also enjoy this year’s passing interface— it's a bit more visually polished, using number icons instead of geometric shapes. The game is packed with power-user features, like the ability to draw custom routes, call audibles, or use the coach camera to see more details about the called play. Football beginners can choose from a very simplified playbook, or even let the game call your plays for you. As I mentioned, NFL 2011 graphics and animation are very good. But sometimes it’s over the top: Players show extended expressions of delight or anger depending on how their play went, and you must tap to dismiss those to skip ahead to the playcalling screen. When you do so, the game employs a deliberate fade transition, which I found frustrating, since it slows down the game’s speed noticeably. On the whole, though, NFL 2011 is a fun improvement over its predecessor. Its omissions—like the lack of a multiplayer option—are far overshadowed by its depth. Whether you want to play a one-off game or a complete football season, and whether you have strong feels on the 3-4 vs. 4-3 debate or just want to tackle, the game offers a thoroughly enjoyable football experience.